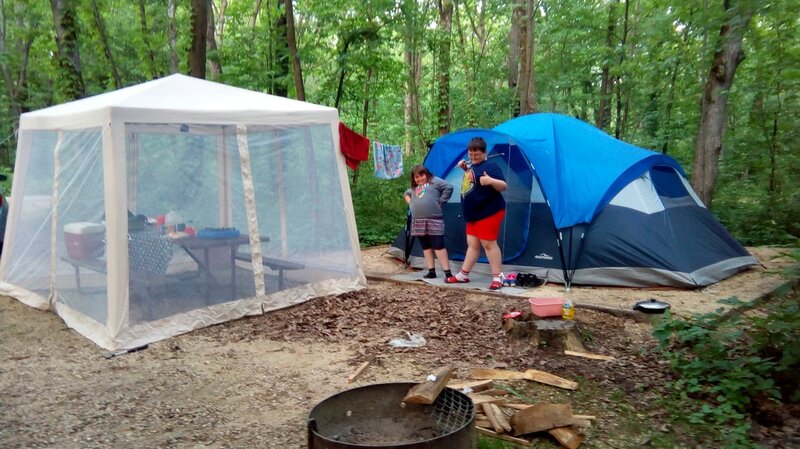 2017-06-09 Sharon and I took our two grandkids who live here in our town for a tour of the Cave of the Mounds west of Madison yesterday afternoon and then camped overnight in the campground of the Blue Mounds State Park nearby. What a fun adventure. The cave is well worth the two hour drive. We all enjoyed the one hour tour. On the 3 mile drive from the cave to Blue Mounds State Park, we stopped in the Village of Blue Mounds for some ice cream. The park campground is very nice. The sites are well laid out with adequate space and isolation between sites and drinking water and toilet facilities are nearby. The one shower house is within walking distance of all of the sites and is among the best we've seen anywhere. The quality of the drinking water throughout the park is excellent with no mineral taste at all. The tent pad on site 53, being on the downhill side of the roadway, was a slightly raised and leveled bed filled in with fine, sandy gravel making the surface a bit rough on the knees when kneeling on the floor of the tent but it would always be dry. I had a footprint under the tent so there was no damage to the tent floor. The campground wasn't crowded Thursday night but I believe it was fully booked for the weekend. ADVENTURERIDGE portable camp stove from Aldi and a butane cartridge which fits inside the stove. For dinner last night I fixed cheeseburgers which our 8 year old granddaughter said were as good as home! She even likened them to McDonald's, which for her is the gold standard! I used our new Adventuridge Butane camp stove sold by Aldi. It is is very similar to one made by Coleman. It is light weight (4 lbs), uses convenient paint-can-like butane cartridges and includes a self-igniter. ​The flame level is smoothly adjustable from very low to high. I used it to fry the hamburgers and heat water last night. Then this morning I used it to fry bacon, fix scrambled eggs and heat water for coffee and washing dishes. Finally, measuring just 14" by 12" x 4" in its case and weighing just 4 lbs, it is easy to take along. Quite a change from the gasoline, pump-up Coleman we used to use years ago! The crowning food item for me, the chef, was home-made biscuits for breakfast, prepared onsite. I used the techniques that Kenneth Click demonstrates in his videos and that I talk about on my page on Backpacking Food under the topic of Solving the Crumbly Cornbread problem. I used one cup of Baking Mix from Aldi and added just enough water to make it stick together. My plan was to bake them in the "boy scouts" cook set from Walmart on my Emberlit Fireant wood stove. But with the kids getting hungry I opted instead for the little BRS Ultralight Titanium Camping Gas Stove, using the coffee can bottom heat diffuser between it and the cook set to reduce hot spots. Both kids acted appropriately impressed with the process but Millie didn't particularly care for my biscuits! Sharon and Elijah and I liked them, so no problem getting rid of her biscuit! Campsite #53 at Blue Mounds State Park. We ended the visit this morning with a 2.4 mile hike including climbing both 40 ft. lookout towers, walked past the swimming pool and then back to our campsite. Blue Mounds State Park is a very nice park. They do well at balancing a true out-of-doors experience while providing good facilities. The swimming pool hadn't opened for the season but looks to be first class. There are a number of walking/hiking trails. Several sections of the trails we hiked felt very much like being in the wilderness. To "top" it off, as their web site says, "Perched atop the highest point in southern Wisconsin, Blue Mound State Park offers spectacular views and unique geological features." 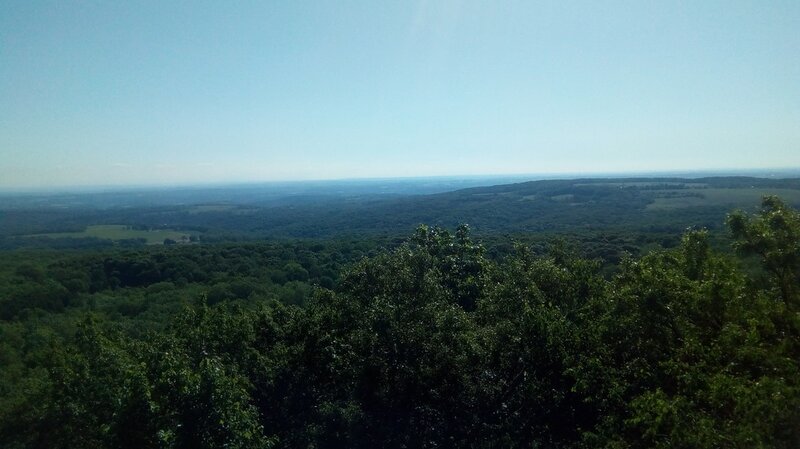 Those views got exclamations of amazement from both kids from the lookout towers so you know they are good. 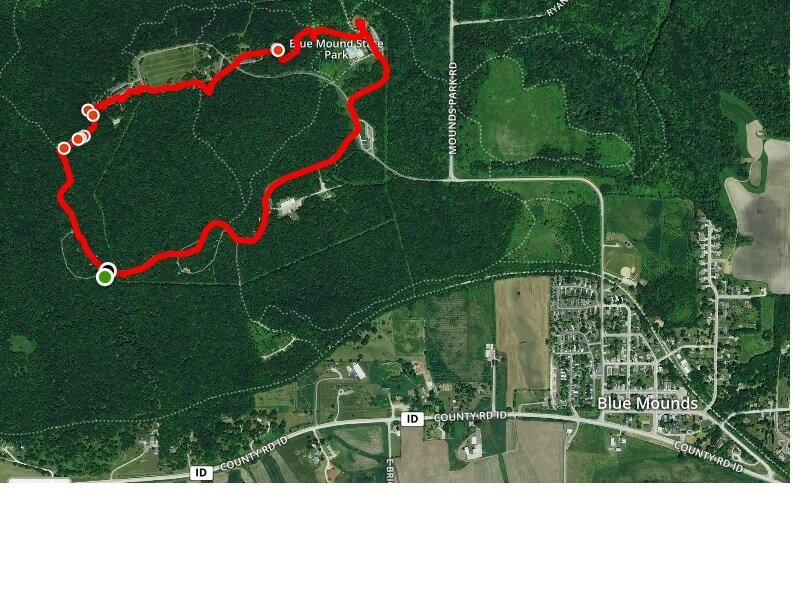 2.4 Mile hike at Blue Mounds State Park. Started and ended at the green dot in the lower left. Trail gained 289 feet to the West, 40 ft. Observation tower.